Have you ever wanted to know how your favourite musician got their start? Or why they chose their particular instrument? Maybe you’re a musician, too, and you’d like some words of wisdom from the best on how to break into the industry or stay on top of your game. Since this blog has offered so many opportunities to speak with so many inspiring artists, each with their own unique upbringing and perspective on the musical world, I thought it’d be fun to come up with a series of questions to ask each of them — questions aimed at unearthing their musical roots, tapping into their industry wisdom, and making them think on their feet. Enter Take Five: the Pickup’s new cheekily-named, ongoing, many-part-series that puts the same five questions to as many jazzers as possible, big and small. The series is directed to readers who are musicians and music fans alike, designed to explore what makes artists tick as creative individuals and industry professionals. How’d you get your start as a musician, and what kind of education led where you are today? What drew you to your instrument above all the rest? 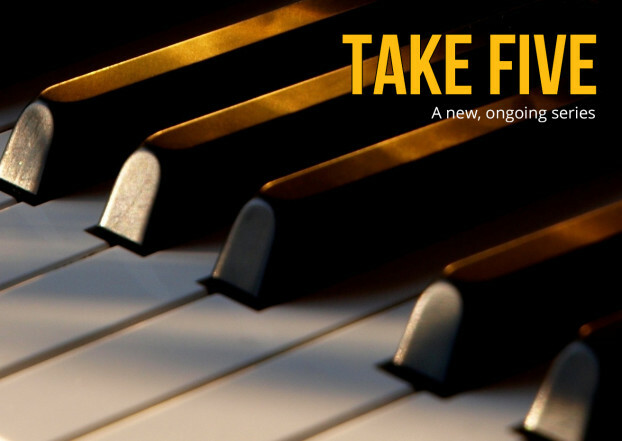 How do you challenge yourself to keep learning and improving as a musician? Can you distill a single piece of advice for young musicians just starting out on their careers on how to be successful? If you could jam with any musician, past or present, who would you choose? What tune would you call? The Take Five questions aren’t set in stone. They may change in the future. And we may adapt or twist them, or ask unique follow-up questions, depending on the subject. But for now, these questions will serve as our base. We’re going to tack these questions onto the end of every interview we do with big artists. But if there’s enough interest, we may expand the series to include local musicians, up-and-comers, and ametures as well. The end result will be a database of answers that one could comb through for a wide range of insights and advice. Here’s an updating list of all the artists who have taken our Take Five questions so far. Keep checking back — we’re going to be adding a lot more to this list over time.